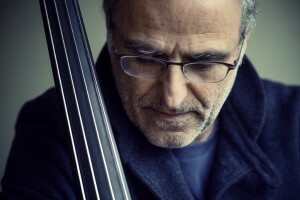 Home > News > River Silver (ECM) OUT NOW – Interview with Michel Benita about his latest release. 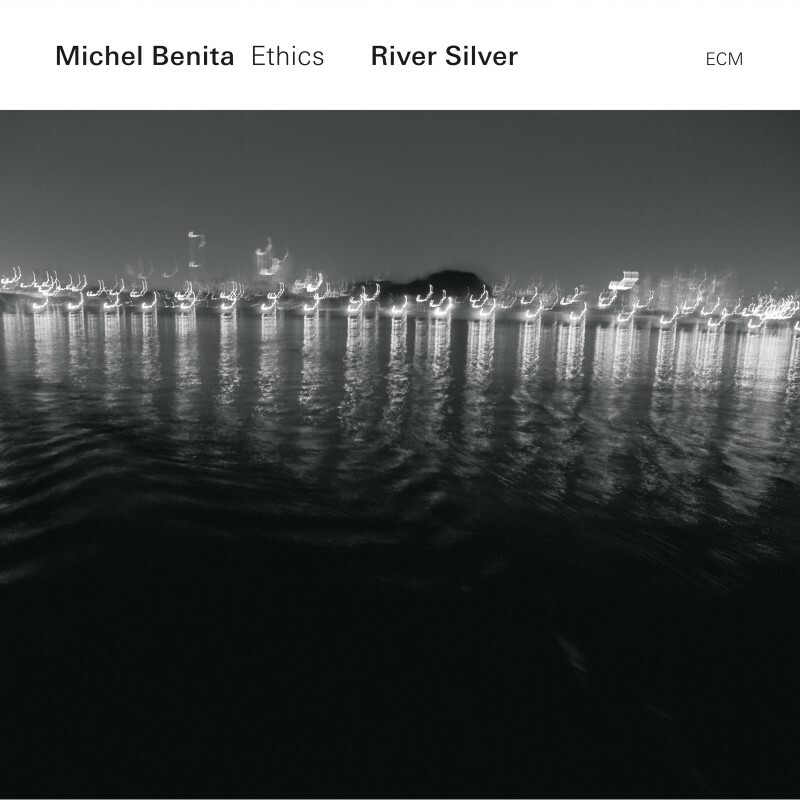 River Silver (ECM) OUT NOW – Interview with Michel Benita about his latest release. After two exemplary ECM discs in the company of Andy Sheppard, Michel Benita has an album with his own group. The Ethics band is international, and the Algiers-born bassist leads a line-up comprised of a flugelhornist from Fribourg, Switzerland, a koto player from Tokyo, a guitarist from Drøbak, Norway, and a French drummer who once lived in Turkey as a member of the Istanbul Symphony. The group’s music, correspondingly, flows – like the glistening river of the title – beyond borders. Alongside his own compositions and a piece by Mieko Miyazaki, Benita includes a tune from Northumbrian UK piper Kathryn Tickell and one from Norwegian composer and organist Eyvind Alnæs (1872-1932). A strongly lyrical tendency prevails, Mathieu Michel’s graceful flugelhorn foregrounded, with koto, bass and drums interacting creatively at the band’s core. Colours of folk and colours of jazz are blended in Michel Benita’s writing, multi-idiomatic in a very natural way . Eivind Aarset’s guitars and what Benita calls “organic electronics” gently envelop the music. The whole sound-picture is finely-realized in the responsive acoustics of the Auditorio Stelio Molo RSI, Lugano, where River Silver was recorded in April 2015, with Manfred Eicher producing. The album is issued in time for a European tour in January with concerts in France, Germany, Austria, Switzerland and Belgium. For more information visit the CONCERTS page. Keep up-dated by joining our Newsletter – just fill in the subscribe box on our HOME page. Benita favours long-term musical associations. Ethics has existed for five years already, with unchanged personnel and the players in the group have also collaborated in other contexts. Michel Benita and Eivind Aarset work regularly together in Andy Sheppard’s quartet– as on the critically-acclaimed album Surrounded By Sea – and the guitarist is also a member of a quintet led by Matthieu Michel. Matthieu has also worked with Michel Benita in bands large and small, while Benita and drummer Philippe Garcia have also often worked in tandem, and appear together on recordings of, for instance, trumpeter Erik Truffaz. Bandleader Benita describes the group’s formation as a gamble: “I originally wanted to see if I could bring the koto into a more or less ‘traditional’ set-up with guitar, bass and drums, but I didn’t know what to expect. It was a small miracle that it worked right away and I knew that I really wanted to continue with this group. I’d seen Mieko Miyazaki on stage a few times – and was impressed by her strong, charismatic presence. She is as fluent in Western music as she is in Japanese traditional music or contemporary composition. Musically, she thinks both ways, eastern and western. This ‘double culture’ quality that she has is essential to the music of this band.” In Ethics, the koto is not deployed as ‘exotic’ colour but is fundamental to the band’s integrated sound, the quintet quietly making a case for international collaboration as the five musicians serve the needs of the compositions. These traditions continue to find a resonance in his ensembles. On River Silver, alongside six of his own distinctive compositions, Benita includes “Yeavering”, a tune from Northumbrian UK piper Kathryn Tickell, which fits perfectly into the repertoire, bass and flugelhorn teasing out its melody. [This adaptation of a folk theme for the language of improvisers might be considered almost a partner piece to “Aoidh, Na Dean Cadal Idir”, the Gaelic traditional song which Benita and Aarset have been performing with Andy Sheppard lately: these players open up the music in new ways]. Mieko Mayazaki’s “Hacihi Gatsu” has been in the Ethics book for some years, performed as a duo for koto and bass, the rapport between the players unmistakable. A propos beautiful melodies: Benita’s title track is a tone poem capturing the light and atmosphere of Paris. Michel wrote it in a friend’s apartment on the Île de la Cité in the Seine, “the sun reflecting off the river flowing past the window. It’s a very pictorial reference…” You can hear the boats go by, a subtle movement of waves and water captured in guitar and cymbal sounds, as the bass steadies and steers the group. The impression is vivid. Q: River Silver marks your debut on ECM as a bandleader, and the second album of your established quintet Ethics. Tell us a bit more about how did the band evolve since its first recording in 2010. A : I’m very happy I could keep these fantastic musicians involved for 5 years now. They’ve sticked with me and were patient, as it took some years before we could find the right moment to finally record our second album. I’m pretty familiar with long stories, as I think that’s really important for the quality of the music. Along the way, and also due to the way Manfred Eicher organizes the recording in Lugano, we kind of left-out part of the electronic side of the music, to concentrate on the collective “acoustic” playing. When performing live, we realized that most of the time the sound of our instruments blended naturally, with no need for extra effects. Except for Eivind Aarset, of course, who’s using a lot of them, but in a very organic way. It’s a bit of a return to basics. Q: Your passion for traditional/world and folk music is a very strong element within your current music making. Tell us a bit more about when did this fascination start and how has shaped/inspired you in the way you compose today. A : I actually started as a folk guitar player, and my first time on stage was singing and playing the guitar with an acoustic trio. Songs by James Taylor, CS&N, Joni Mitchell were on the setlist. I’m from a generation that saw the explosion of the british folk (and blues) scene in the late 60’s with bands like Pentangle and guitar heroes such as Bert Jansch and John Renbourn. John Mayall was their blues counterpoint. And at that time, I met older musicians who introduced me to the great american folk/blues singers like Big Bill Broonzy or Lightnin’ Hopkins. I was also into the Beatles and the pop/rock scene. Jimi Hendrix, Led Zeppelin and so many others. The 70’s are probably the best period ever for that music. And a lot of my interest for the so-called “world” music came through my love for indian music. Thanks George Harrison and Ravi Shankar ! Coming back to folk music (and its declinations like bluegrass and even country music), not only I never lost interest in that scene, but I discovered young incredible musicians who renewed those genres, like Jerry Douglas (dobro), Chris Thiele (mandolin) or Alison Krauss. Such programs like BBC’s Transatlantic Sessions celebrate folk music in a fantastic way by organizing beautiful sessions with Scottish and American musicians. Q: This might be a terrible generalization, but Jazz is often stereotyped and categorized in a very narrow way. Usually mainly associated with music produced from the 30’s until late 50’s. Even though this was a tremendously important moment in history for what we call Jazz today, it strikes me that very little is said about what Jazz musicians are doing now and how has the genre evolved. In your view how would you describe contemporary jazz and give us a few examples of musicians/albums you believe should be more widely recognized. A : I think Jazz is not a style in itself. It’s an attitude, a way of playing other styles of music, actually. I should say any kind of music. And why is that ? Because jazz musicians can improvise on a very high level. Then, when you have spent so much time learning how to litterally compose new music in the instant, exploring and developing your personal world, you’re able to play absolutely any style of music and make it your own. Realtime composing, that’s what it really is. The relative disinterest for some of the most original kind of jazz played nowadays, is mostly linked to the fact it’s instrumental music, in my opinion. People seem to have lost track. Singers are everywhere, I’m almost sure some people have never heard any piece of intrumental music in their whole life. Everybody should listen to Jon Hassell’s “Marifa Street” or Anders Jormin’s “Xiei” ! Q: As we have mentioned before you are not new to recording for ECM – however tell a bit more about your experience working with ECM and producer Manfred Eicher, particularly as a bandleader on River Silver. A : Recording with ECM was a bit like an old dream coming true. I bought my first ECM album when I was 17 – Keith Jarrett’s “Facing You” – and even hitch hiked from Nice all the way to Munich for an ECM Jazz Festival in 1972 ! Through the years I met and played with some very fine ECM artists like Dino Saluzzi, Bob Stenson, Peter Erskine or Enrico Rava, so I feel I’ve always been like preparing myself for the day. Half-consciously probably. I think it was the right time, the right band with the right music. Manfred Eicher is definitely the best producer I’ve ever worked with. I discovered an enthusiastic man, focusing on music like nobody else I know, and so passionate, in a very juvenile way. His propositions and ideas are only driven by the goal of making a great album, trying to get the best from the musicians and have their music rendered in the best possible way. I just love this way of working. Add to that : his recording technique – live in a great sounding room, like a classical orchestra – and you’re close to perfection, or… silence. As in ECM’s first slogan “The most beautiful sound next to silence”.